Increase productivity, minimize costs and grow your brand reach with simple communication plays everyone understands and anyone can use. Communication is a team sport. Everyone in your organization needs to be on the same page and we help you get there without being complicated, controlling or expensive. Are you frustrated at the growing effort you're putting into more and more promotions activity with little signs of success? Are you tired of playing internal referee between decision makers, producers, departments and stakeholders? Do you spend too much time in reactive mode and not enough time planning ahead? This is what we live for. Let’s talk. I was new to my role and my role was new for my church. Everyone knew our communications needed help (beyond just getting projects done) but we didn't know how or where to start. The coaching season was exactly what I needed to clarify my job function and streamline our communication activity. I grew in confidence as a communications advocate and am using best practice tools to help guide other departments to remove barriers and engage with their audience. The planning session opened my eyes to what drives outside communication. And, as a result, I focused my inside role function to empower staff for more productivity and impact. It's a game changer to the contribution I bring as a leader and the next steps our church takes to bring real value to our community. Kem is one of the most creative thinkers I know. Yet, even more impressive, I am more creative and insightful when I’m around her. She catalyzes and fuels creativity. In a recent project, Kem ignited our process with her unique energy. She brings insight, innovation, and fun to what can be a difficult process. I believe that good coaching makes us better. Recently, we at Mountain Lake Church had a complex and difficult message to share with our church body. Kem helped us develop a strategy and detailed steps to deliver this message to our various audiences. We could not have done this without her guidance and experience. If you think about it, churches should be the best communicators given the importance of our message. If you want a solid, executable communication strategy, I would encourage you to take to Kem! 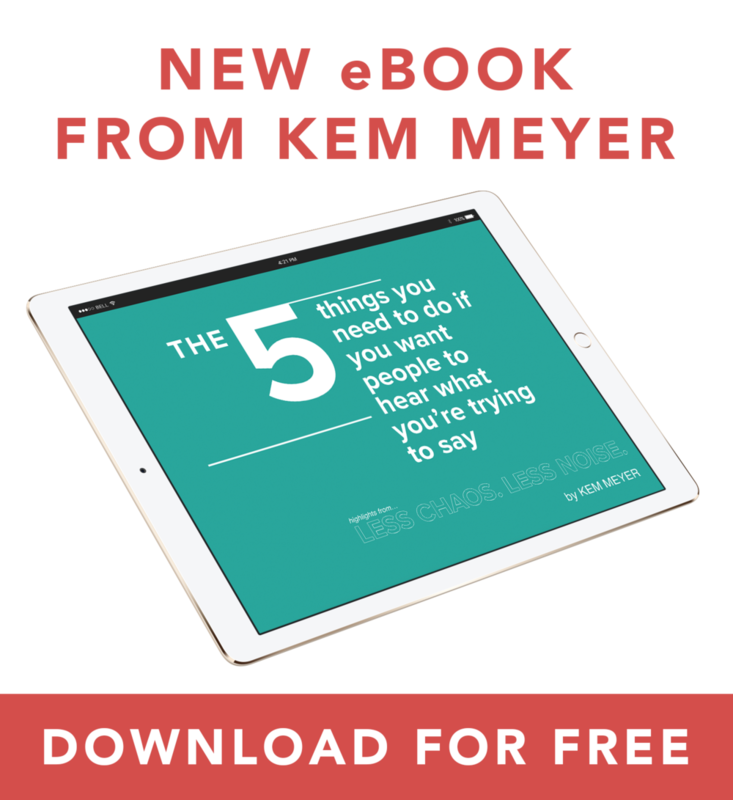 "Kem Meyer is inspiring! Challenging us to think less of the noise and more about the impact of every platform of communication, Kem has helped Real Life to ‘clear the clutter’ and focus on effectiveness." Is the constant frenzy of over-communication wearing you down? Has fighting for attention, keeping up with the growing demand for more email blasts, Facebook & Instagram posts, signs, postcards, handouts, bulletins, mailings, videos brought the results you want? Got it! Check your email for instructions. Start simple. Start small. You’ll be amazed at the results.